Over the past couple of years I’ve followed the fascinating Junto debate about whether or not we can see the War of American Independence as a civil war. Tom Cutterham and Christopher F. Minty have both put forward some excellent arguments outlining the strengths and weaknesses of this model. Whether or not we should use the term “civil war,” a great many contemporary writers often described the conflict as a tragic war fought between Britons. Today, I want to add a little more to this debate by breaking these Britons down into their component parts, and briefly examining how popular attitudes towards one of the ethnic groups we’re left with, the Scots, affected English and American ideas of the war during its early years. Most writers employed the term “civil war” in order to provoke a powerful emotive response amongst their readers. A civil war was, ultimately, a tragic war. The outbreak of war consequently presented American writers and printers with a dilemma; how could they encourage people to fight in a conflict which so much of their popular literature continued to lament as “an unnatural civil war” against a people with whom they were bound “by the tenderest ties”? How, too, could they fight against Britain without alienating their British supporters, many of whom were busily churning out petitions and raising subscriptions on their behalf? What the Americans and their English supporters needed was a scapegoat; an outsider who could be blamed for the miseries of ministerial coercive policy, one who could be demonized and dehumanized into an enemy they would be willing to kill. As so often happens in these situations a common enemy was forged from an ethnic minority, in this instance the Scots. The position of Scots in Britain and America made them ideally suited to take on this role. A large proportion of Scottish migrants to America were relative newcomers who arrived during a surge of emigration from the Scottish Highlands in the 1760s. Many of these men, women and children settled in relatively insular communities in the Southern backcountry, and tended to side with the loyalists at the outbreak of war. In Britain, too, it was widely believed that Scots overwhelmingly favored coercion. Rumors circulated that a “Scotch Junto” of political figures led by the Earl of Bute secretly controlled the cabinet and the King. The Junto, it was whispered, had masterminded the Stamp Act in 1765 and the Intolerable Acts of the early 1770s, and was now driving war with the Americans forwards in order to extend Jacobitism and arbitrary power across the British Empire. English radicals commonly referred to the conflict as “this wicked Scotch War,” “the bloody Scotch war in America,” “this Scotch civil war,” or words to a similar effect. American and English newspapers made great efforts to Scotticize the image of the British army at the outbreak of war, both in its composition and its manner of warfare. 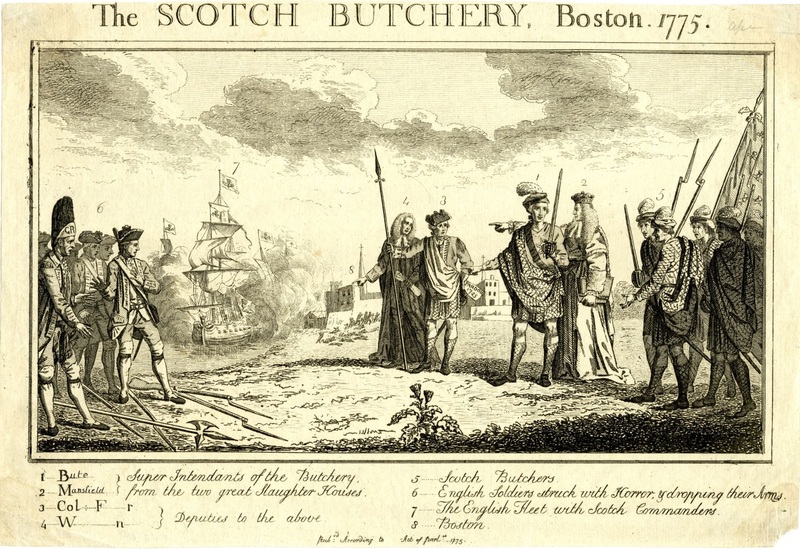 Reports of military recruitment claimed that the English and Irish were refusing to enlist, “so general is their abhorrence to being sent on a Scotch errand, to butcher their countrymen and fellow soldiers in North America.” Scots, however, were depicted as willing and enthusiastic recruits. A host of articles in English newspapers wondered at the “recruiting Parties [who] were never known so industrious as they are at present in most Parts of Scotland.” As an ever increasing number of English newspapers claimed that English soldiers were refusing to “wade through the blood of their countrymen,” American newspapers provided assurance that their soldiers were equally reluctant to fire upon the English. The Pennsylvania Packet, for instance, claimed that “the rifle-men resolve to take aim at the Scotch officers: it affords great diversion to the English to hear of the American rifle-men’s resolve.” For those Americans who were not yet willing to shake off their English or British identities, a shared Scotophobia enabled ties of Anglo-American solidarity to remain in place. Other reports emphasized the violence of the Scots in the British army. In one particularly long and venomous letter to the London Evening Post, an English writer claimed that “Scotchmen, Hottentot-like, can rejoice in the midst of blood, can chaunt [sic] a Pebrugh, stained and bespattered with the blood of a yankee; and with their daggers fresh reeking from the sacrifice of freedom, can toss up their heels, caper, and dance a reel to the shrieks and yells of his innocent wife and helpless prattlers.” Such stories tended to originate in English newspapers, most likely as an attempt by English sympathisers to disavow themselves of responsibility for various atrocities reported in the press. Their circulation in America, however, helped to promote a very different image of the enemy. The Americans were no longer fighting their fellow-countrymen, but instead a demonic, Jacobite enemy who, if not resisted, would force them to ‘tamely submit to a Scotch yoke’ of arbitrary power. As the war progressed, the need for a common enemy to unite against diminished. After declaring independence, Americans no longer felt much need to maintain ties of national identity with their English supporters. The English in turn grew less inclined to support America once the latter allied itself with France and Spain. But Scotophobia was certainly both powerful and useful during the early years of the war. By turning the Scots into a common and particularly hateful enemy, newspapers could continue to employ civil war rhetoric without discouraging troops from taking up arms. The Scots were British enough to back up the image of a civil war, but still alien enough to provide a foreign enemy who could be hated, demonized and fought against. Norwich Packet, May 11, 1775. A large number of English and American newspapers printed or reprinted rumors of the Scotch Junto. The radical weekly publication The Crisis in particular gained widespread circulation in both Britain and America, and regularly damned Bute and Scottish influence in politics. See for example The Crisis, no. V, February 18, 1775; reprinted in America in the New England Chronicle, June 29, 1775 and the Providence Gazette, July 15, 1775. See for example Public Advertiser, May 11, 1776; London Evening Post, May 10, 1777; General Advertiser and Morning Intelligencer, February 26, 1778; London Evening Post , March 10, 1778; St. James’s Chronicle, December 20, 1777; Norfolk Chronicle, March 14, 1778. Connecticut Gazette, April 28, 1775; Derby Mercury, February 10, 1775; Pennsylvania Packet, September 25, 1775. Similar sentiments appear in a let to the London Chronicle, August 10, 1776. In reality English military participation was higher during the war than at any point in the preceding century. See Stephen Conway, The British Isles and the War of American Independence, (Oxford: Oxford University Press, 2000), 11-44. London Evening Post, February 6, 1777; Constitutional Gazette, November 29, 1775. Thanks for a great post, Tim! I’m glad you mentioned the various fears circulating around the Bute cabal and its power over George III. People in the British media were referencing that early modern conspiratorial rhetoric about Scots as recently as the General Election in May, in reference to Nicola Sturgeon influencing the Labour Party. Plenty invoked it in the Blair-Brown years as well. Britain, it seems, has never quite shaken the popular image of the Scots cabal at the heart of power. It’s also interesting to encounter this kind of discussion in American discourse that attempts to explain the breakdown in civility between Englishmen on both sides of the Atlantic. The tendency is to associate fears about arbitrary government and corruption at the heart of government with Catholics and the threat of popery, but that kind of rhetoric was just as readily deployed against people like the Scots whose militancy (whether manifesting in radical Presbyterianism, or Highland clannishness) was just as much a threat to Protestant liberties and the rights of Englishmen as Catholics. I will say that can’t help but wonder what men like John Witherspoon and Alexander Hamilton made of Scotophobia in the colonies in the 1760s, given their strong ties to the American cause. Thanks for your comment Craig! I very much agree that Scots still occupy the sinister ‘[wo]man behind the curtain’ role in the English imagination. I have a feeling it’s no coincidence that Malcom Tucker in the BBC’s ‘The Thick of It’ is a more overtly Scottish version of Alastair Campbell. It’s also been fairly interesting/depressing to see people sprouting the same old historical anti-Scottish rhetoric in the comments under any news stories even vaguely related to Scottish Independence, the SNP, etc. over the past year. Your point about the arbitrary power being seen in both Scottish Jacobitism and radical Presbyterianism has given me quite a bit of food for thought! It’s not something I’d really considered much before, probably because, as you say, it’s so easy to focus solely on the Scottish Jacobite image. It’s certainly something I’d like to look into a bit more, so thanks! One thing I’m trying to figure out is whether the anti-Catholic riots in Glasgow and Edinburgh in 1778 and 1779 actually led to a more positive image of the Scots as militant Protestants in England – but perhaps their Presbyteranism was still not to be trusted? Not too sure about Hamilton, but Witherspoon certainly had a fair bit to say on the matter. He seemed to believe that Scottish loyalism during the revolution was actually a response to popiular Scotophobia. The Patriots had allied themselves with arch-Scotophobe John Wilkes in England, which put the Scots off supporting the American cause. His ‘Address to the Natives of Scotland Residing in America’ was an attempt to win them back. Alexander McDougall, who moved to New York from Islay in the 1730s, was known across the colonies as ‘the Wilkes of New York’ from 1770 onwards. I haven’t come across broad-based Scotophobia towards him. Nor the Livingston family. Cadwallader Colden, on the other hand, was the ‘Jacobite drummer’. Thanks Christopher, Alexander McDougall is a really interesting guy. I think his case shows that in America the politics of Wilkite radicalism often outweighed national prejudices, whereas in England the balance between the two was much finer. I don’t think McDougall received much attention from the Wilkite’s in England, but not sure whether this was down to his Scottishness or something else. I’ve also seen the inverse occurring in the British press – English politicians effectively labelled as Scots because of their political principals (just spent the last half hour failing to find my notes on this). I’ll offer this thought, cribbed from something my advisor says to me a lot: anti-popery (meaning a general disgust towards arbitrary government) was often at its most effective when deployed against non-Catholics. That is to say, this needn’t be a direct comparison between Scots who were avowed Jacobites and neo-Covenanters (although Ned Landsman has suggested plenty of both lived in the frontier communities you referenced), because plenty were prepared to tar even moderate Presbyterians with the arbitrary brush. I’d guess that Scottish anti-Catholic riots endeared them to some in the Americas (in New England) and not others (the Virginia gentry) because, as we know from Colin Kidd, Episcopalians were as much their target as Catholics were. That Presbyterians were Reformed Protestants mattered, I think, when reflecting on how they were conceptualized by Anglicans, Puritans, and even Quakers. These are great questions, ones I’m wrestling with about a century earlier in my own work on Scots in the 17thC colonies. My question about Witherspoon came from a vague memory of having read something about his reaction to all this before, and I remembered where that was. You probably already know about this article, but just in case, I’d recommend Gideon Mailer, “Anglo-Scottish Union and John Witherspoon’s American Revolution,” WMQ vol. 67, no. 4 (2010), pp. 709-746. Interesting! However, it does raise a question for me: what did all of the Scottish immigrants who were fighting in the Revolutionary War think about this? Thanks for your comment Abigail. One of the biggest frustrations (or failures) of my PhD has been my inability to answer precisely this question! I’ve focused mainly on published sources to get the big translatlantic picture of Scotophobia, but the diaries and journals I’ve looked at as well haven’t given me much information about the Scots’ own experience of Scotophobia in America. I’ve got a bit more on the other side of the Atlantic – e.g. one rather horrid case of bullying where a Scot living in London was always forced by his club to read out the anti-Scottish newspaper articles at their meetings for the amusement of the English members. But there’s a definite gap in my research for the equivalent experience of Scots in America. Where you particularly thinking of Scots fighting for America or for Britain? Or perhaps for Scots on either side? I was thinking more of Scots fighting on the American side — why would you fight for independence only to, if you succeed, end up in a new county where you’re the reviled minority? This particularly interests me because I know at least one of my ancestors did exactly this. Interesting blog Tim. I don’t doubt there was rampant Scotophobia amongst the English and colonists in this period, but it might be argued that the Scots dominance of transatlantic commerce attracted much more ill will than their political appointments. During Glasgow’s ‘golden age of tobacco’ between 1740 and 1790, the city’s ‘Tobacco Lords’ and their associates in America monopolised the Virginia trade in tobacco. So much so, that in one year, 1769, there was more tobacco imported to Clyde ports than all the English ports – including London – combined. From an economic perspective, the rise of the Scots in the Chesapeake after 1707 is a remarkable story. Certainly, they were an ethnic minority but they were disproportionately powerful and controlled the trade in the main export commodity, mainly due to their exploitative ‘store system’ of transatlantic commerce. On the one hand, the English were jealous of the dominance and – not without foundation – accused the Glasgow merchants of smuggling in contravention of the Navigation Acts. On the other hand, the large tobacco planters in the colonies were also resentful but were tied into credit agreements that meant they were dependent on the Glasgow stores for over-priced goods shipped over from Scotland. It has been estimated that Glasgow’s merchants were owed £1mill stg. in 1776, although perhaps the majority was paid back under Loyalist claims. Good blog, and I look forward to reading more. Thanks for your comment Stephen! Although I’ve not included it in this post, I agree with you that economics strongly shaped American and English Scotophobia. I’m putting together a case-study of Virginia as part of my PhD thesis, and Scottish dominance of the tobacco trade is one of the major themes in most anti-Scottish articles I’ve found in Virginian newspapers. James Currie, the Robert Burns biographer, wrote a defense of the Scots against accusations of unfair business practices in the Virginia Gazette, arguing that it stemmed from people who owed money to Scottish businessmen and were unable to pay off their debts – very likely those who were tied into the unfair trade agreements you mentioned. From what I’ve found so far I think economics played a greater role in provoking Scotophobia in the Chesapeake than it did in New England – most anti-Scottish rhetoric there tended to be a bit more political (or simply xenophobic), but the big picture of Scottish trade dominance still had an effect there too. Thank, Tim. Most of my research is focused on Scots in the Caribbean, 1776-1846. A comparison of Scotophobia in Virginia and, for example, Jamaica would be great. There is a great quote by Trevor Burnard in his book on Thomas Thistlewood; a contemporary saying amongst the English on Jamaica compared the Scots to a fart! Paraphrased ‘They smelt bad, and once they came out, they didn’t return!’. Hehe. However, as far as I can see, Scotophobia was much less in the Caribbean compared to America and I guess one factor was because the Scots did not dominate the sugar export trade as much as they did in Virginia (although they were also disproportionately represented as planters in Jamaica, St Vincent, Trinidad, Tobago etc). There was some opposition to the establishment of Scottish Presbyterianism in Jamaica in the 1780s, but that’s another PhD! Added you on Twitter – and I look forward to reading your work. Great post. I wonder if there was any sort of Indian component to the “othering” of the Scots in North America. There has been some work about the Highland soldierrs and ties to Native Americans. I’m sure there could also be something in regard to their peripheral position on the frontier and ties to native communities. Some of my ancestors were Scots POWs, transported to Massachusetts and sold and as bond slaves in 1651. About the time of the 1745 Jacobite rebellion, my line changed their name from Stewart to Steward, possibly as a negative reaction to events in Britain. These same Stewards volunteered in the Mass. Militia during the American Revolution, finalizing their separation from the Mother country. Assimilation, was, I think, key to their decisions. They had served in virtually all the prior Colonial conflicts, and felt that America was now their home. Any comments on how this links to other conspiracies, such as those in this article, would be appreciated. And who might Mr. A be?